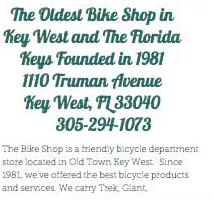 The Bike Shop is a friendly neighborhood Bicycle Department Store located in the heart of Old Town Key West on Truman Avenue. We are a family-owned and operated bike shop providing personalized customer service since 1981. If you're looking to purchase a bicycle, repair your bicycle, rent a bicycle or buy parts and accessories for you bicycle you've come to the right place. The Bike Shop has been selling, servicing and renting bikes for over 34 years. We have a large selection of bikes to choose from-Trek, Giant, Momentum,3G, DelSol, Phat, Sun, Origin 8, and State Bicycles. have hundreds of bikes to choose from. We carry a full line of components and accessories, too.